Vice Chair Of DNC Tulsi Gabbard Resigns To Support Bernie Sanders : The Two-Way On Meet the Press, Rep. Tulsi Gabbard of Hawaii announced she'd resign her post at the Democratic National Committee to endorse Sanders, citing her military experience as the impetus for her decision. Rep. Tulsi Gabbard attends the 33rd Annual Women's Campaign Fund Parties of Your Choice Gala on April 22, 2013, in New York City. Democratic Rep. Tulsi Gabbard of Hawaii has resigned her position as vice chair of the Democratic National Committee to endorse Bernie Sanders. 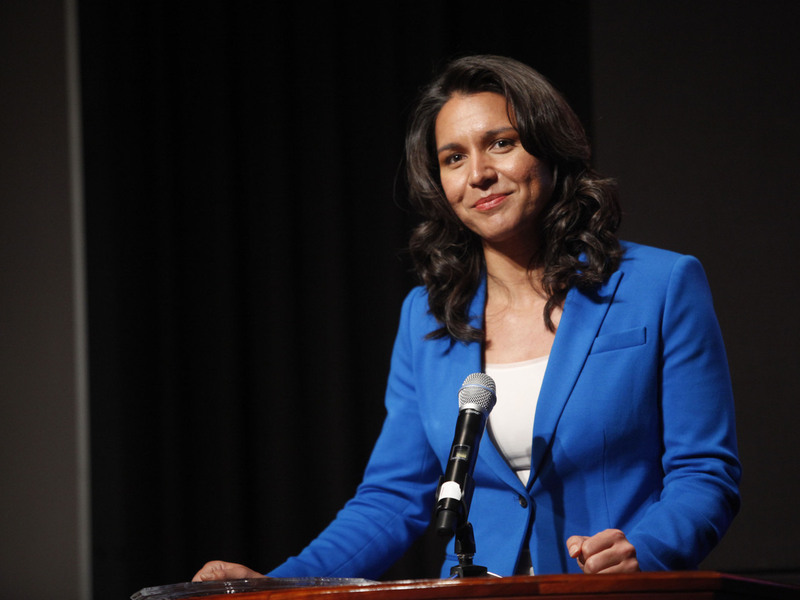 Gabbard announced her decision on NBC's Meet the Press Sunday morning. Gabbard, 34, is one of the youngest members of Congress and the first Hindu elected to Capitol Hill. She served in Iraq and with the Hawaii National Guard, and cites her military experience as the impetus for her decision to back Sanders. "As a veteran and as a soldier I've seen firsthand the true cost of war," she said. "I think it's most important for us as we look at our choices as to who our next commander-in-chief will be ... to recognize the necessity to have a commander in chief who has foresight, who exercises good judgment." She's the fourth current member of Congress to endorse Sanders, and the most high-profile.